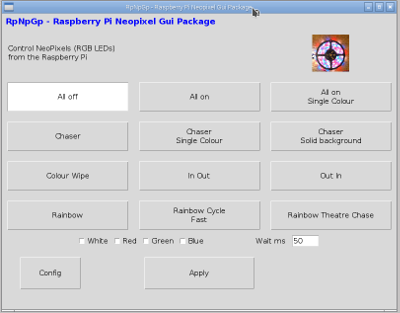 I've started work on a graphical application to control Neopixels using the Raspberry Pi. This is one of my first projects using Python and Tkinter. It's primarily designed for a disco DJ environment where a DJ may want to change the LED sequence based on the music being played. It uses nice big buttons (ideal for touch screens) to choose from a selection of pre-programmed sequences. I'm still working on it, particularly the lack of documentation, but it can be used now. The software has been tested using the MyPiFi Neopixel Controller board which is currently available on ebay if you missed the kickstarter.